This is an intense image, one made with some personal risk. I saw this on Instagram and was immediately struck by it. Can you tell a bit of the backstory? 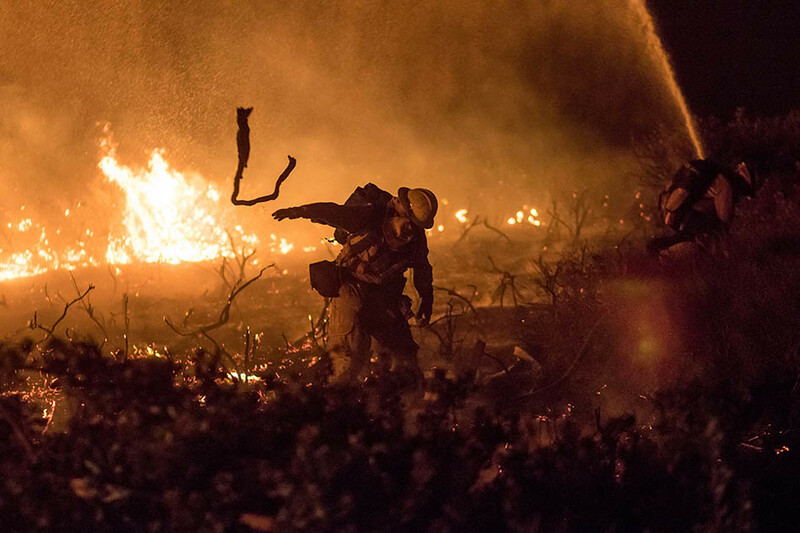 This photo was taken during a blur of wildfire coverage. The coverage spanned three days where I was working the nightshift for AFP. 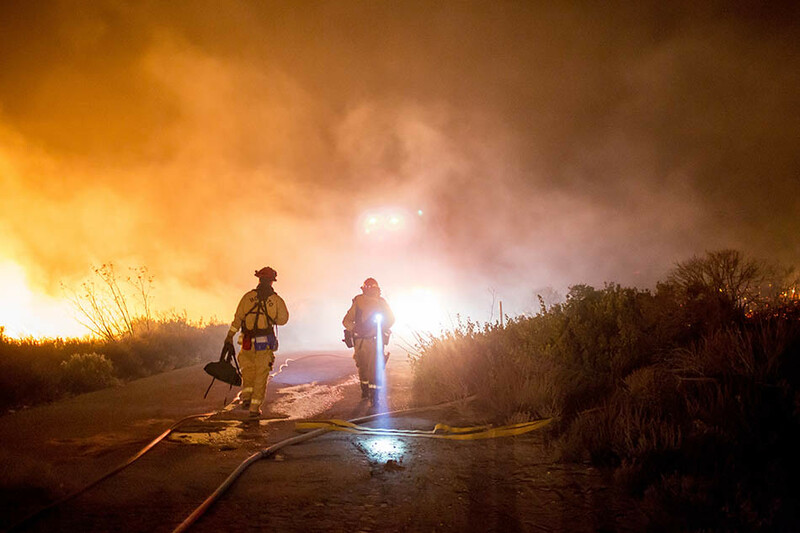 My main objective during these nights was to visually inform people of the immediate dangers of some of the five major fires burning in Southern California. 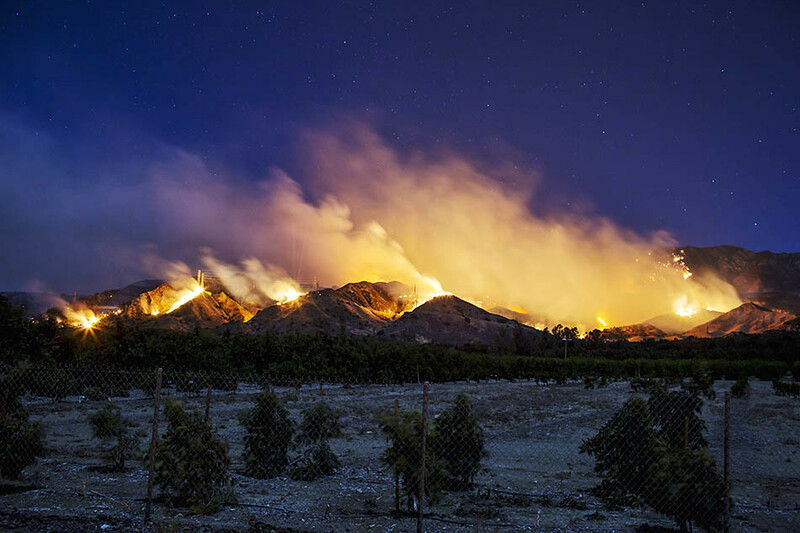 This image was taken just before sunrise at the Thomas Fire, which would go on to be the largest wildfire in California’s recorded history. There were major threats to cities and roadways in the region and hundreds of thousands of people were evacuated. 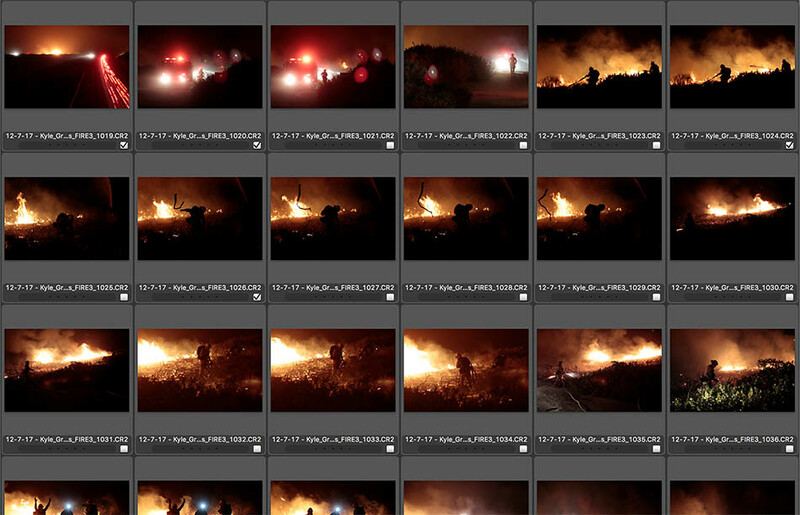 This was my third assignment covering wildfires, and this happened in what I understand to be the off-season. This was part of a huge news event recently. How did you initially get involved and what was it like at first? As per usual with freelancing, I have no idea what kind of work I’m going to be thrown into. I never know who is going to call, when they are going to call, or what for. I just have to be prepared. Thankfully my background as a newspaper photographer has given me a variety of experiences that I can apply to freelancing. Spot news has been fairly uncommon since my switch to freelance, and it is more surprising and urgent when I get these calls. I was first thrown into wildland fire coverage for Reuters, and sharing those images on social media led to this call from Agence France Presse. Reuters took a chance on me, which led to someone else taking another chance. 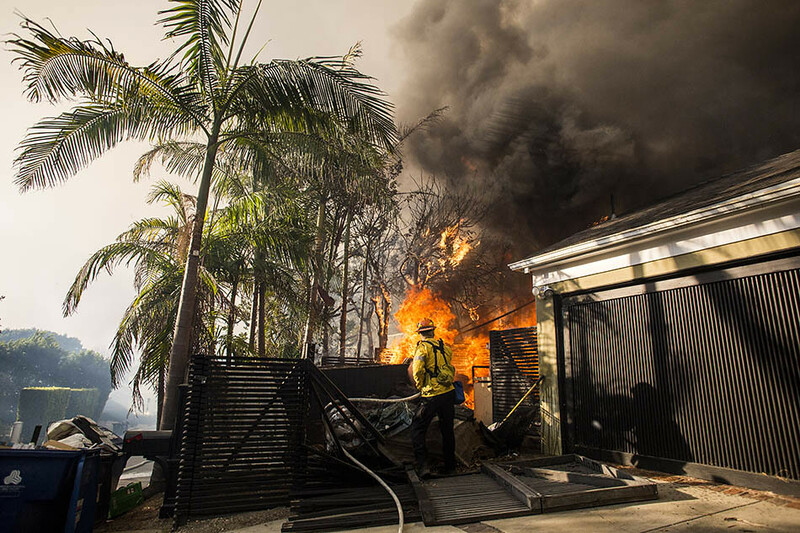 I have covered plenty of structure fires in the past, so the first time I was asked to cover a wildfire, I assumed the situations would be similar to a massive structure fire. The reality of an entire landscape in flames was a surreal and completely different experience. The fire’s unpredictability, the whirling, creaking, popping gasps of noise, the way that it formed a life and environment of its own, was like nothing I have seen. A quiet sort of chaos. I’m always curious how photographers problem solve. What issues arose and how did you work through/resolve them? On my first night of coverage, I had transmitted a handful of images. All of them were bad. It was almost 3 A.M. and I felt like I had nothing. 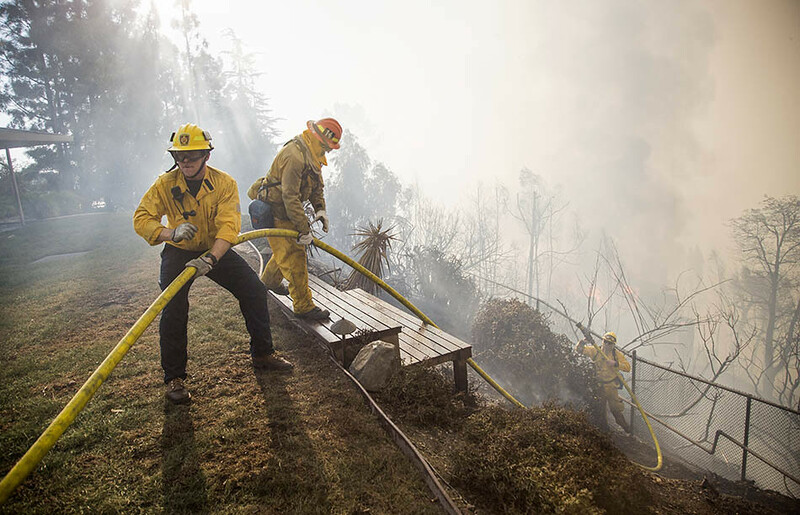 I was assigned to cover the fires during the second night of the Thomas and Creek Fires, and the intensity had decreased, but containment was still very low. The first day can be wild and fast-moving. That’s when the majority of property damage occurred with the Thomas Fire. There was nothing visibly going on at that time in the Creek Fire, just north of Los Angeles. I had already been working the scene for about 12 hours and at this point, the bigger story was the Thomas Fire. I was the only one from AFP working this shift, and I wasn’t sure whether I should keep working or call it a night. I had to make a big choice without the possibility of an editor’s approval. I decided to take a chance and drive a couple hours to the Thomas Fire to see if I could change the trajectory of my night. It is always a risk moving locations. Not knowing if you are moving away from the most active area toward a quiet region or vice versa. Mainly, you need to make the most of what you are seeing while being constantly aware of the progress of the whole fire. In this instance, persistence was my problem-solving mechanism. The only images I liked from that night were from after I took that chance and pushed on. The night would have been a total waste if I had done the reasonable, yet easier option and gone home. How did you monitor such a fast-moving news event, and one that changes so quickly? There are a ton of interesting ways to keep track of a fire now. I have been learning as I go, adding layers of information and immediacy to my coverage. My first couple fires I was primarily using the local NPR Station and a police and fire scanner app. Since then, I’ve found a great 24 hour AM radio station and a Twitter feed for Cal Fire Scanner, which tracks active zones, threatened houses and the most recent flare ups. The National Interagency Fire Center has an incredible map showing the perimeter of these fires. If you want to be mesmerized by a beautiful website tracking wind gusts, check out Windy.com. Using all of these tools while staring at topographic maps to predict the direction and speed of the fire, I try to put myself in the best geographic locations. I spend the majority of my time using maps and Twitter to plan out my timing and movements. While we’re not really a gear website, I am curious what type of gear you used in these situations (clothing as well)? I’m not really a big gear guy, but I’m glad you asked this question. My most crucial piece of gear is the 7-gallon water tank I keep in my car for emergencies and long assignments. Beyond the essentials of eye protection and an N95 face mask, I was woefully lacking in protective gear. Before adding Nomex fire gear to my kit, my general rule was wear cotton, cover up, and drink lots of water. On this occasion, I showed up with a buttoned up jean jacket, my Canons on my shoulders, and a hyper awareness to non-verbal cues. A lot of the protective gear is bright yellow Nomex. For the firefighters to see you in that color, to see you in a helmet, implies an initial level of protection and preparedness that can give you access in risky and dangerous situations. Because I didn’t initially have the necessary protective gear, I had to rely on body language to convey my caution and situational preparedness. 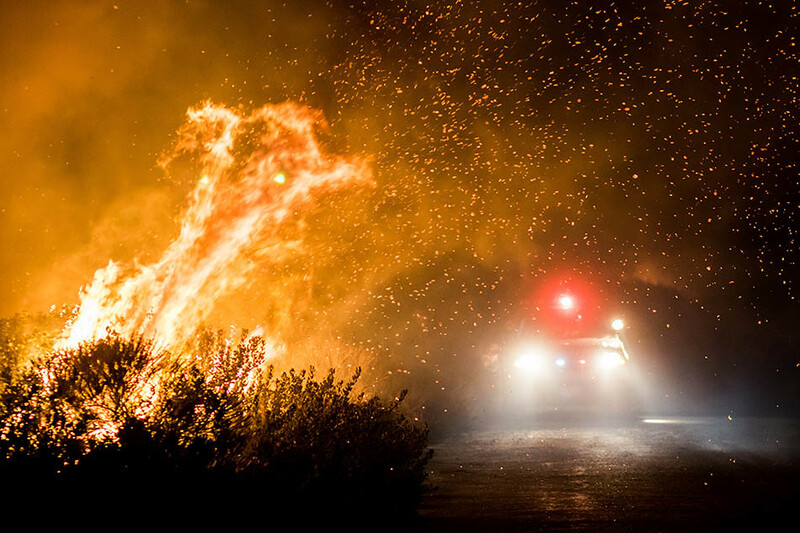 A lot of quick decision making happens during wildfires, and conveying awareness through visual cues is more effective than verbal in the sometimes loud, chaotic environment in close proximity with emergency workers. Now, I have a full-body Nomex suit, a helmet, and even fully-enclosed eye protection and am adding a fire shelter and a half-mask respirator. Even with an N95 mask, I felt like I had smoked two packs of cigarettes each night. I felt the adverse effects of smoke exposure for days afterward. . I try to limit the number of lenses I carry to protect them from the damaging smoke and extreme heat, but in the end, the only reason I have this gear to make images. For this particular assignment I was working in very dark situations where I relied on my primes (20 mm, 35 mm, 50 mm, 85 mm) to make it work. Collateral damage is implied during this kind of work, but I try to do my best to avoid it. I’m curious how photographers gain access and trust. How did you gain access to the firefighters and work so closely? The firefighters are there to work. I am there to work. They need to see that, not have to ask it. There is an LAPD press pass that will get me past the initial police line, but dealing with firefighters is largely non-verbal. When I arrive and make the initial wave, it is not like I am really saying, ”hi.” Usually, within the quick exchange of a low wave or a head nod, there is a non-verbal acknowledgement of each other’s purpose, and I can get to work. If they are moving equipment, I quickly I get out of the way. I emphasize my motions to convey respect. They need to see that I am aware of my surroundings. I don’t just stand still; I’m constantly looking, moving, watching closely to be sure that I am not slowing their work. I walk with a purpose and make it known that I am there working, I am prepared, and I am supposed to be there. We tend to preload each situation so much we can end up changing the outcome. If you focus too much on what you don’t want to happen, you may get just that. Establish your intention and project yourself appropriately. During your time with them, what surprised you the most? After being told to vacate an area once a few months ago, I am constantly waiting for a firefighter to tell me I need to leave. I am perpetually bouncing between self-actualizing statements like, “I’m supposed to be here” and the contradictory, “Oh god. They are going to make me leave.” Like other times in photography, you have to weigh how close is too close and make those decisions based on danger, content, and composition. The pictures tend to get better the closer I work, and one of my big worries is that I will be told to move further away. After I had made my way back to my car and parked along a closed road to file, an incoming fire truck pulled up to my car and a firefighter got out. Right there, I thought, “Here it comes, he’s going to tell me to leave.” But when I rushed out of my car to see what he needed, he just nicely asked me to move my car so they could park where I was. The firefighter was just as worried about impeding my work as I was his. When I am faced with a photographic fight or flight situation, I’m surprised at how long I can endure. I worked for some 43 hours in three days, and I didn’t think anything of it because I had been given the opportunity to cover the news. Most of my experience as a freelance photographer has been working to prove myself to people, so that I can cover important stories. Some people talk about the adrenaline of covering wildfires, and when someone gives me a chance to cover any news, I feel that same adrenaline. A lot of freelancing for me involves self-doubt and then proving myself wrong. Not getting the work that is important to you can wear on you as a freelancer. For me, all of that negativity goes away when I’m given a chance to tell a story. Now, onto the main image. Can you tell us what was going on and how you worked to make the picture? 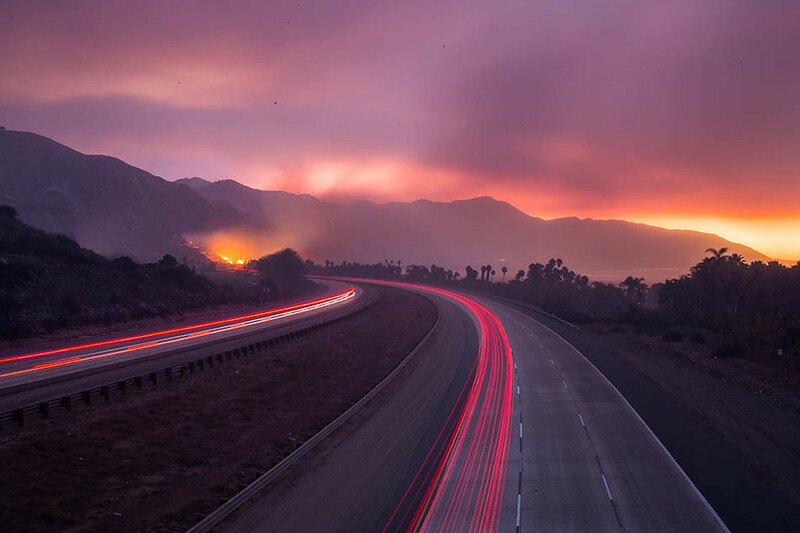 During this night, the Thomas Fire jumped over a highway along the Pacific Coast and was heading toward the oceanfront houses on the other side. More than 1000 structures were destroyed. The fire had jumped in a spot where a small road led right into the fire. I had been roaming the coast north of Ventura looking for activity and trying to create images that showed how the highways were being affected. When I approached the area, I was on a narrow side road that cut between the two roadways. As a general rule, it’s safer to stay with the firefighters. So, when I saw them speed up this road, I followed cautiously. I never want to get in the way of the firefighters, so I kept my distance at first. Once I had parked in a place that was out of the way of the trucks, I started to approach the men as they attacked the flames from both sides of the road. The team I was watching was just starting on a major section of burnt hillside where the flames were whipping across the road. The wind seemed to be coming from both directions sometimes and the firefighters got to work right away. Once I was certain that I was out of their way, I got as close as possible. I was constantly checking my surroundings while keeping an eye on the wall of flames to my left. This image was taken about 10 feet from the firefighter as he readied his equipment and cleared out burning tree limbs before turning on the water. I was curious about their process and I wanted to show the intensity of their non-stop work. These men and women work through all hours and I’m always trying to convey the intensity of their effort to combat these fires. Natural Disasters are increasingly affecting all places in different ways. Be prepared for anything. The tragedy, death, and loss that results from these disasters is not the imagery that most people ‘want’ to create. Be aware of what could happen in your own region and be ready. Emergency preparedness is fairly simple. Living in Los Angeles has made me think more widely about the geography and reach of natural disasters and what is likely to happen when it does. Sometimes, my fear of not being prepared makes me feel like a doomsday prepper, but there is a sense of security in knowing that if an emergency hits, I will have water and basic essentials to suffice on the job or with my family. Don’t accept the assignment if you don’t know you can do it safely. If emergency workers see you in a polyester jumpsuit on the edge of the fire, you are going to get yelled at. And for good reason. I have been asked to leave a certain area before, and I think a big reason for that was my lack of protective gear. Now that I have more protective gear, I feel like I can do a better, safer job. But, even now when I get these calls, I have to go over the risks and evaluate my own preparedness for this situation before I say I can do it. Also, get a good respirator. The health risks of this work are immense. Protect yourself. We tend to preload each situation so much we can end up changing the outcome. If you focus too much on what you don’t want to happen, you may get just that. Establish your intention and project yourself appropriately. 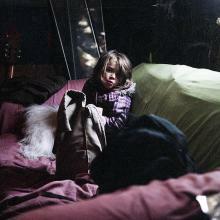 Kyle Grillot is an independent photographer based in Los Angeles, California, specializing in news and documentary photography related to social issues, subcultures, politics, and portraiture. He earned a Bachelor of Science in Visual Communications from Ohio University, and worked for newspapers throughout the Midwest before succumbing to the pull of the West. When he is not working, he can be found gardening with Christina, skateboarding, or running trails with his dogs, Easy and Parker. 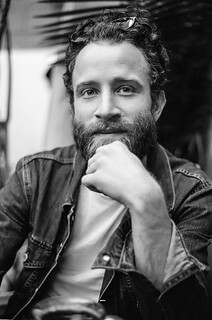 His work has received recognition from the National Press Photographers Association, the Associated Press, and the Wisconsin News Photographer Association - Student Photographer of the Year. Some of his clients include ESPN, Reuters, Agence France-Presse, Buzzfeed, The New York Times, and The Washington Post.